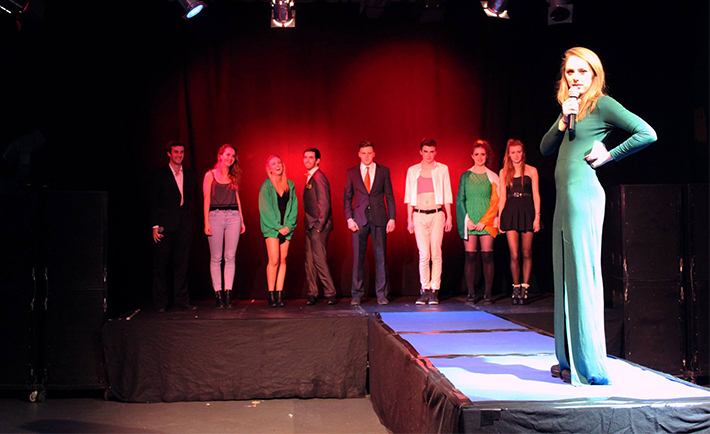 DCU Style Society ran their first DCU’s Next Top Model event yesterday evening. The event was the first of its kind and was a parody version of the hit TV show, ‘America’s Top Model’. Members from a number of different societies on campus each nominated a model to represent their committee with contestants from Enactus, Cumann na Gaelach, Cancer SOC, ESOC, RAG, Drama, Dance, LGBTA, Art Soc taking in the show. Similar to the Tyra Banks’ popular television show, America’s Next Top Model, each contestant took to the stage and performed a series of hilarious challenges and photo shoots, in the hope of being awarded the DCU’s next top model title. The show was hosted on the night by DCU’s own Tyra Banks, Alison Ring. Speaking to The College View prior to the event Alison spoke about how she was looking forward to the talent on show. Judges on the night included former Style Society chairperson and Lifestyle writer for the Irish Independent, Freya Drohan, vice chairperson Claudia Gocoul and Shane Hayes.